William Wright (1773-1860), whose professional career began in Bristol, England in 1796, moved to London and acquired a large practice in aural surgery that included the Duke of Wellington and other members of the nobility as patients. Eventually he became one of John Harrison Curtis’ fiercest and most outspoken rivals, rallying against the prevalence of quackery in aural surgery. Part of his early career included teaching deaf-mutes the elements of speech, an approach that was scarcely offered by other aurists of the day. [I]n 1818, I presented to the late Queen Charlotte, and Her Majesty, in consequence, appointed me her SURGEON AURIST. 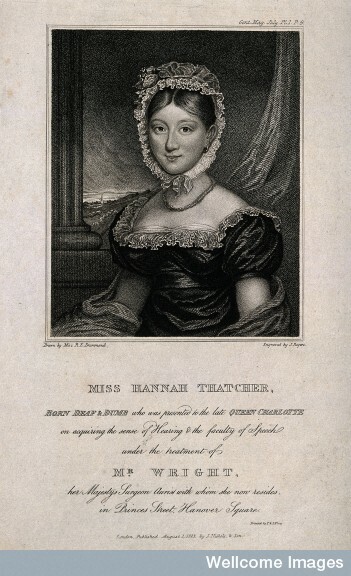 This young lady was born totally deaf and dumb, of which I produced ample proofs, and continued so until she came under my care; I attended her most sedulously for a length of time, and when she was introduced to Her Majesty, she then heard, and was learning to talk, and since that period, improved so much, as to be capable of holding communication, by means of the sense of hearing.